This is the first part of my series of recipes from Liquid Intelligence. I’m going to make all of them, which you can see here. I had heard a few weeks back on Cooking Issues Dave talking to one of the callers about making Justinos using just Pectinex and gravity (or God’s centrifuge as his guest called it). He said the mixture was shelf-stable so you could just wait it out. I believe Dave was talking about dates rather than bananas, but I decided rum was probably high enough alcohol to be shelf-stable anyway, even with a few bananas blended in. I’m far from a scientist though so please take that as nothing but the rambling of a random guy on the internet. All I can tell you for sure is that I drank some of it and didn’t die. 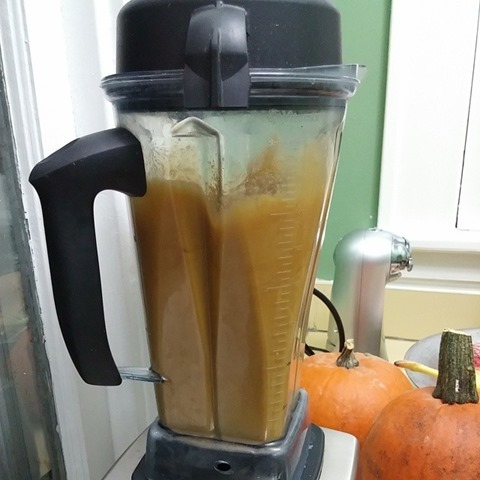 Though Liquid Intelligence makes use of a centrifuge, those of us without $10,000 to spare have to wait so I decided to try his banana Justino recipe when I knew I was going to be out of town for awhile. 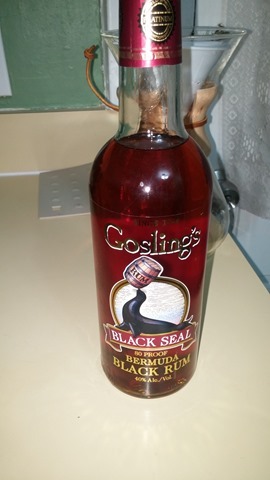 Blend a bottle of rum (I went with my default dark rum, Gosling’s Black Seal) and three bananas with 2g Pectinex Ultra-SPL. Strain through a Chemex back into a bottle. Voila. You can see I got most of a bottle back. The taste is fantastic. I mean, it’s banana and rum. You know the combo. I served it as Dave recommended. I made ice cubes out of coconut water, poured the Justino over it, squeezed a lime wedge on top, stirred, and topped with a star anise pod. Here it is half-drank. I was too busy enjoying to get a great picture. 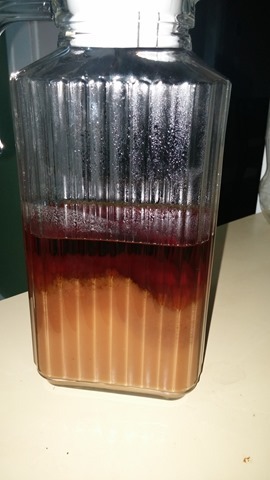 This entry was posted in Recipes and tagged liquid intelligence on November 25, 2014 by Genius.